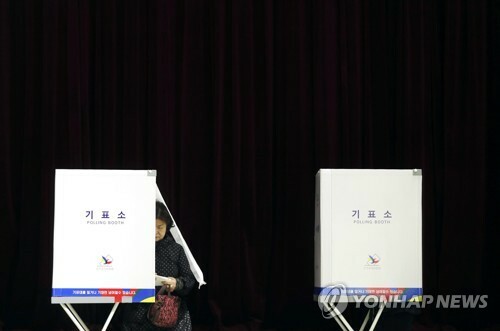 SEOUL, May 9 (Yonhap) — Tens of millions of voters headed to polling stations Tuesday to pick the country’s new president after their former leader was removed from office in a high-profile corruption scandal. Turnout reached 70.1 percent as of 5 p.m., 11 hours after voting began at 13,964 polling stations nationwide. An official from the National Election Commission (NEC) said it expects the turnout to reach the 80 percent level by the time the voting ends at 8 p.m., which would mark the first time since the presidential election in 1997. “There was high participation in overseas voting and early voting, and a voter survey by the commission shows that more people are eager to vote,” the official said. The election comes in the wake of the March 10 ouster of former President Park Geun-hye over a massive corruption scandal that eventually led to her arrest and indictment. A 35-year-old office worker Kim Jeong-soo, who came to the polling station with his pregnant wife and two kids, said he hopes the next president provides better policies to raise children in the country. Many voters celebrated the election, taking photos at polling stations, sharing them on social media and encouraging fellow citizens to take part in the vote.